My family starts the day off with a fruit smoothie, oatmeal or Greek yogurt and I am always searching for healthy foods to add to it to give it a nutritional boost. Linwoods Superfoods has amazing products including the delicious ground Flax, Sunflower, Pumpkin & Sesame Seeds & Goji Berries blend. This nutritious blend is so flavorful and even my children love eating it. I like that it is cold-ground which protects the Omega 3 essential fatty acids. It is ground so that the seeds and berries are effectively absorbed by the body and one serving (4 Tbsp) provides six grams of fiber, 5 grams of protein and B vitamins. I appreciate that the products are gluten free and contain no added sugars. Most importantly, it tastes delicious and can be used in so many different ways such as adding it to soups, sandwiches, as a salad topper (one of my favorite ways to eat it), baked potatoes, pasta and so much more. My husband has severe arthritis in his shoulder due to a birth defect and enjoys one serving daily of the Flaxseed, Cocoa, Strawberries and Blueberries. He is usually the most reluctant in our family to try anything new that he perceives as “healthy” but he thinks this product by Linwoods Superfoods is delicious. He especially likes that it contains omega’s which his specialist recommended for his joints and I found a granola recipe on the Linwoods website that I am planning to make for him to include in his lunch box. 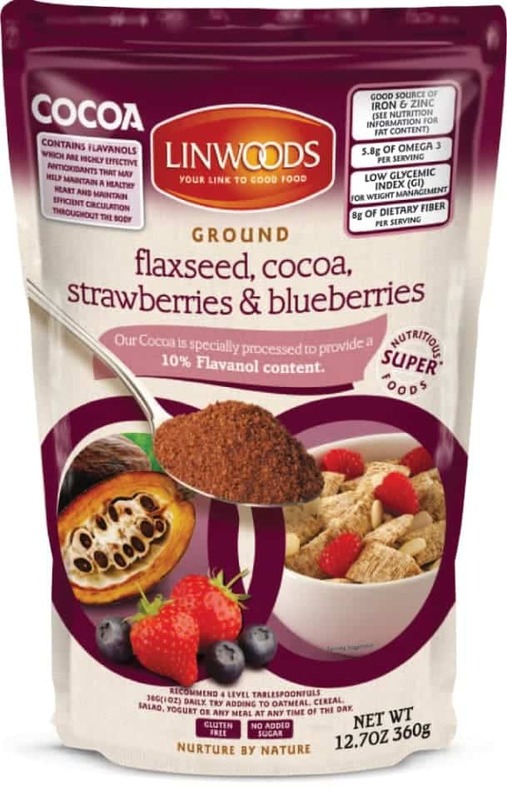 There are many different super foods options available at Linwoods which is proud to be “your link to good food.” They certainly have made new fans in our family because these ground flax mixes and berries are a new part of our daily nutritional routine. You are invited to visit Linwoods to browse the entire product selection and to purchase your favorites.